After rising to fame as the setting of the Leonardo Dicaprio movie The Beach, Maya Bay has continued to attract swathes of visitors. Although the beach is now closed for recovery, you can still enjoy Phi Phi Don from afar. 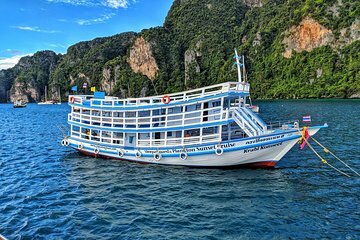 This sleep aboard option, which is the only tour that offers an overnight package, lets you feel like you have Maya Bay all to yourself. You’ll swim with glow-in-the-dark plankton; kayak to sea caves; have a campfire on a deserted beach; and sleep on the top deck beneath the stars.